The Printer Filament might seem fairly unsuspecting in The Division 2, but it becomes a crucial resource later on in the game. In our Division 2 Printer Filament guide, we'll be walking you through how to farm Printer Filament in The Division 2 as easily as possible, so you can upgrade the crafting bench that you've been using so far over the course of the game. For more guides on The Division 2, be sure to check out our The Division 2 Guides Hub. It’s where you’ll find info on the best weapons, skills and ways to earn XP, as well as a look at the exotic weapons in the game. 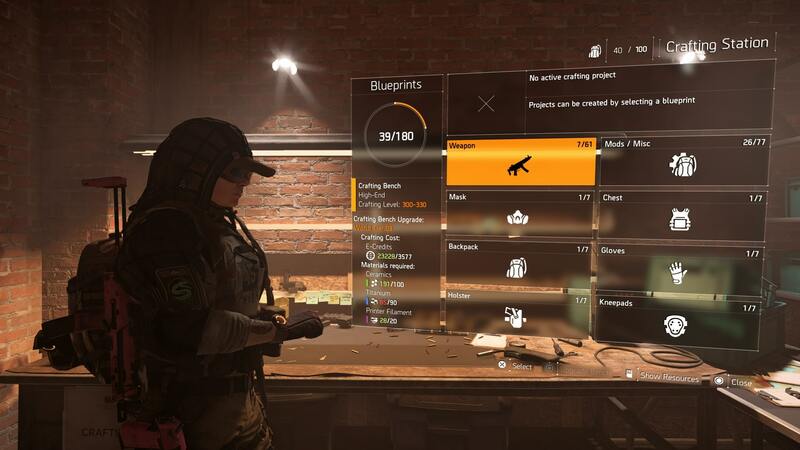 As you get into the later stages of The Division 2, you’ll need to start crafting your own gear to increase your Gear Store. The reason for this is that you’ll need to hit a minimum Gear Score to access some of the game’s strongholds. To do so, you’ll need to keep your Crafting Bench up to the same level as your World Tier Rating. Printer Filament becomes very important here, and is one of three components that you’ll likely find yourself needing. Let’s take a look at where to get it. You’ll likely have accrued a healthy amount of Printer Filament by the time you unlock the crafting bench, but you’re going to need a lot more if you want to go toe to toe with the harder enemies found in the Black Tusk areas of the game. To get more Printer Filament in The Division 2, you need to deconstruct Gear Mods, and Skill attachments. You can find these in your inventory, listed under the mods section. You’ll want to keep your better mods, but once you’ve increased your gear score a bit, you’ll quickly find a bunch that just aren’t particularly useful anymore. It’s also worth deconstructing gold Gear Mods, if you know you don’t have a use for them, as this will net you 3 Printer Filaments a piece. As you get to the endgame in The Division 2, you’ll need to start upgrading your crafting bench. This is because there are currently four tiers of endgame loot. They range from World Tier 1-4, with each housing its own range of gear score loot. Each upgrade will cost you more and more Printer Filament, with the later stages costing upwards of 25 units per upgrade. Well worth deconstructing any Gear Mods that you can, then.